Please arrive 30 minutes early to order food or drink. Shefali O'Hara is a type IV cancer survivor. She was given 6 months to live, 16 years ago. She has used art as therapy and teaches others how to use painting to tap into their own creativity to facilitate healing and growth. You can find her art on her Facebook page: Austinlace. At a Rover Studios Needle Felting Workshop, you will learn the basics of using hand felting needles to turn carded wool (Roving) into soft sculptures. Projects can include anything from realistic pet portraits to soft handmade toys to imaginative whimsical creations made completely by hand and in the company of a creative and convivial crowd. In needle felting, wool is compressed and shaped by jabbing a barbed needle into a ball or mat of wool the tangle and link the fibers. The process is surprisingly soothing and the results are routinely charming! All the tools and materials will be provided for the initial $25 fee. Returning crafters, Frequent Felters, fee is $20 for materials and the space. Tools are sharp and 3D projects are most appropriate for 14 and up. If you want to include a younger crafter let me know and an suitable 2D project can be included. 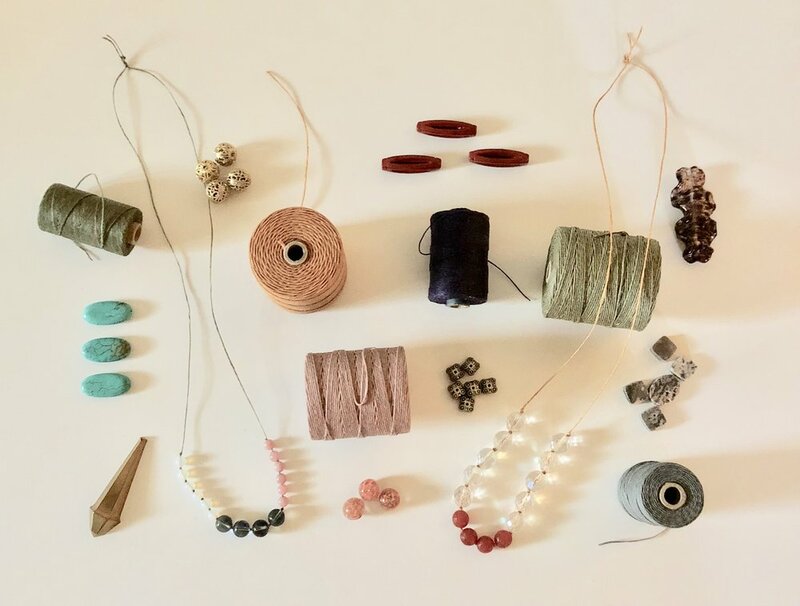 April’s workshop will focus on posable 3D creations with wire armatures inside, but simpler project can always be arranged Workshop leader, Xan, comes from a long line of fiber artists. Bubble & Squeak is a British breakfast served with boiled cabbage. Bubble & Squeak is also a FREE stand-up comedy show hosted by Andrew Wagner at Brentwood Social House. The best part? You don't have to eat boiled cabbage! Unless you want to! This comedy showcase is headlined by Joey Z and featuring comedians Angelina Martin, Scott Sticker, and Gabe Davis. The evening will be hosted by comedian Andrew Wagner. This fun-filled art workshop will encourage kids to put their creativity into action! Using recycled materials donated by the Austin Creative Reuse we will create mixed medium projects to match each season. Join us as we decorate mini flower pots in celebration of spring! Create flowers out of pipe cleaners to place inside or save your pot for planting real seeds to nourish and watch grow. $8 per child. All ages welcome. We will have Manifest Mustache - a jazz trio comprised of swing dancers turned musicians - playing from 10am-noon. Enjoy the hot jazz music from the likes of Django Reinhardt with your morning latte. Get to Know Austin Shakespeare! We will have a little social time, read some Shakespeare and introduce 3 of our programs (ie: production, education, and volunteering). There will be NO fundraising pitch. These events are just meant to Get to KNOW people! Handmade leather, ceramic, and wire earrings and accessories. All proceeds support our non profit organization, One29 Ministries! Songwriter Social is a live listening show and podcast that picks the brain of the songwriter. Each show will capture intimate performances from two songwriters as well as a chance to learn more about their lyrics, songwriting process, influences, and other various items of possible interest. Also don't forget about audience interactions and songwriting/musical games! Drop by Brentwood Social House for the reception of new painting by three phenomenal local artists. Get inspired by uplifting art, have a chat with Eva, Natalya and Phillip and check out the gift table ….who knows… maybe you will find a perfect gift for the upcoming Mother’s Day . Eva Sim-Zabka is a Brentwood resident and an expressive contemporary painter working in acrylics, oils and mixed media. As a formal psychologist she was always interested in creative self-expression. Art turned out to be a perfect playground for her to continue the journey. She paints intuitively and experiments a lot during the painting process. Her art evokes emotions. She was born in Poland, lived in Germany and moved to Austin in 1998. She is an active member of Creative Arts Society. Her work was juried into several shows and won awards. She has been invited to show her paintings in California and Europe. She enjoys painting full time and is thriving in her new career. Natalya Crier paints in oil and acrylic with a particular focus on flowers, animals, birds and lively natural settings. She has been a local business owner in Austin over the last 30 years. She holds a degree in Art and Theater in costume design form the formal Soviet Union. Austin painter Phillip Wade is unusual in painting an incredible variety of subjects, animal and human portraits, landscapes, museum interiors, and the large story-telling paintings (The Mad Hatter, Puss in Boots) that were inspired by his years painting at his mother’s home in Cornwall, England. He has been an instructor in Painting at The Contemporary Austin (Laguna Gloria) since 1997, and is represented in innumerable collections, e.g. The Driskill Hotel, the actress Diane Ladd, and the Tyler Museum of Art. After graduating from the Pennsylvania Academy of Fine Arts in 1981, he studied with Bob Levers and Kelly Fearing at U.T. Austin, earning an MFA in 1984. Milly McSilly will be at Brentwood Social House with her Bubble Magic! Kids of all ages will be able to blow their own bubbles, make their own giant bubbles and bubble wands, and go inside a GIANT BUBBLE! 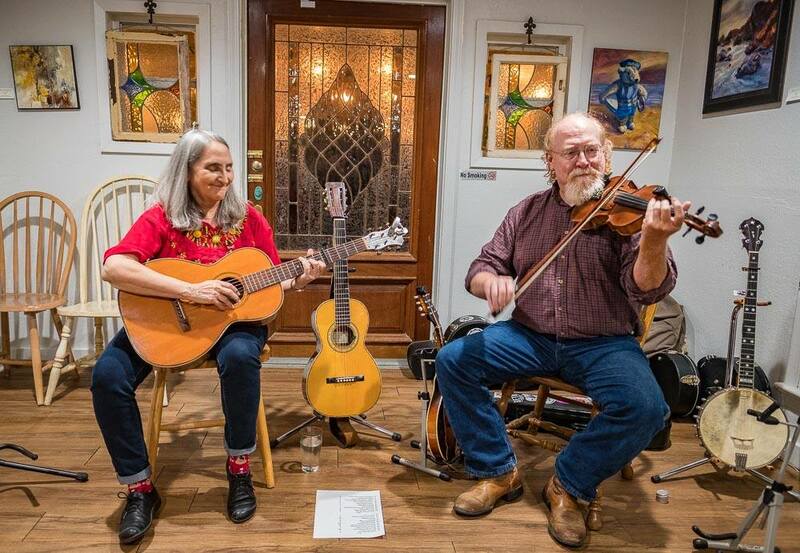 Christy and Dan play old-time, country, bluegrass and hillbilly music for those music lovers who enjoy old sentimental songs, new sentimental songs, snappy rags, crooked breakdowns, or hard-driving, claw-hammered dance-tunes. Originally from St. Louis, MO, long time Austin guitarist/vocalist has been performing since participating in an open mic at an Austin Friends of Traditional Music meeting at the Split Rail, in 1976.. Vocal influences range from 1920s jazz stylings, to hot swing of Fats Waller, Ella Fitzgerald, and full circle back to the old songs of Appalachia and early country and bluegrass. 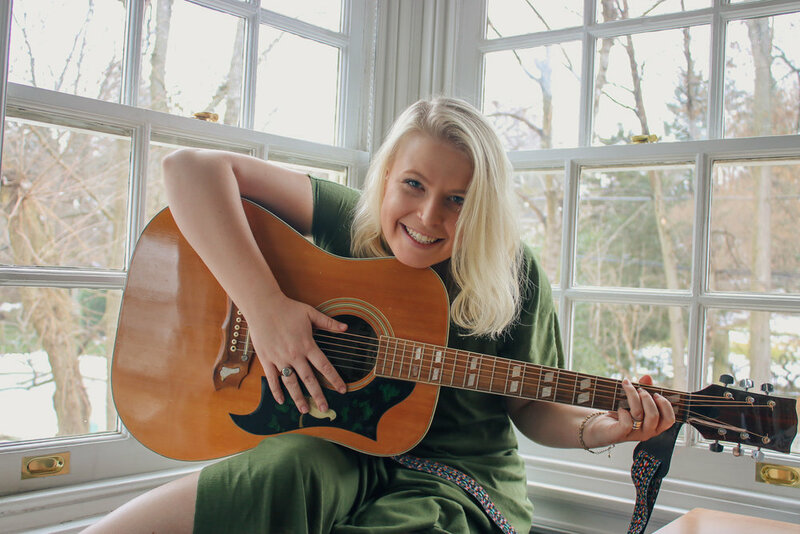 She also is pleased and honored to include the original songs of local songwriters, John Clay and Dan Foster in the Plowboys repertoire. Christy has performed Dixieland, big band and in her own jazz quintet (Jazz Me Blues in the late70s), and in an all women old-time band (The Decibelles, 1990s). Christy Palumbo Foster and Dan Foster appear on Rounder Records compilation, the American Fogies, Vol. 1 : Various Artists (CD, 1996). Christy also performs regularly with the Austin Balkan Singers and the Austin Banjo Club. Dan has been around the Austin music scene since the mid-70s. A native Texan with roots in North Carolina, he has been fascinated with traditional music since the age of 14 when he first saw the great Texas bluesman, Mance Lipscomb. Playing the fiddle, mandolin, banjo, and guitar, Dan is known for seeking out the unique and unusual from the hidden treasury of American music and delivering both instrumental and vocal renditions true to style. From the Kentucky long-bow of Buddy Thomas and J.P. Fraley to the rollicking Georgia fiddle tunes of Gid Tanner and the Skillet Lickers, Dan’s love of southern fiddling is genuine. But novelty rags on the mandolin and new-made songs for claw-hammer banjo are also in store, along with sentimental southern harmonies when he joins Christy to sing their favorites from long ago. You should come and listen while they sing old songs new to the ear and new songs old beyond their years. Join the La Leche League of Austin every 3rd Thursday at Brentwood Social House from 10:00am - Noon for Breastfeeding Cafe! Hang out with other nursing parents, share experiences, and get support. Accredited LLL Leaders will provide accurate, up-to-date information about breastfeeding as well as offer encouragement and support. Learning from others who have breastfed their babies can be helpful and reassuring. Let us be part of your village! Based in Austin, TX, The 512 Four is a saxophone quartet that plays popular tunes, classical pieces, jazz standards, and any other interesting piece arranged for saxophone. Members of the quartet hail from various big bands, concert ensembles, blues, and rock 'n roll groups around the capitol region. Over several years our paths kept crossing, and we decided to join together to form the quartet. I have been playing music for most of my life and the road to this CD was a winding journey but with some clear markers. Sometimes stories start at the beginning but this one starts on the back end of the middle. The first step occurred in 2001 when I found one of John Lennon’s acoustic guitars. Actually, I didn’t find the guitar; it was a gift from by beautiful wife Tammy and Barbara -- best mom-in law a man could have. And to be completely honest it isn’t technically “one of John Lennon’s guitars.” It’s an Epiphone EJ-160 John Lennon Signature model. A guy can dream can’t he? My John Lennon guitar sounded great. My buddy Dave at Guitar Resurrection set it up. I loved the action and the feel of the neck. I had played bass, keyboards and some electric guitar in bands for over 25 years but this was a new jumping off point. This was my first acoustic guitar and learning to finger-pick was a bit like traveling to Mars.... I was starting from scratch. So I searched out artists that I admired to learn songs. I was drawn to the work of Robert Johnson, Muddy Water, Lightnin’ Hopkins, Big Bill Broonzey, Townes Van Zandt, John Prine, James Taylor, Keb Mo, Steve Earle and obviously John Lennon. I begged, borrowed and nicked as many licks as I could handle. The next catalyst to my odyssey was when my daughter Kate was born in 2006. The addition of a beautiful new baby girl to our family brought on a natural shift of priorities. I was a new dad again. I was home more which had an added bonus -- I started playing my acoustic guitar more, writing songs and actually finishing them. When Kate was very young I would take the guitar into the bathroom for her tub time. While she played with her little tub toys, we had BIG fun. We sang songs, made up songs, and I would sneak in little ideas I was working on and write. Half of the songs on the CD were written or created during this period. Having Kate on the cover of the CD was natural. She was my muse and song-writing partner. The time together with her allowed me the opportunity to create these songs. The last piece of the journey was to start playing these songs out in public and the reconnecting with friends. Austin isn’t a bad place to do that. Without using a worn out slogan it is true that you can't go two hundred yards in any direction without running into a music venue. So I went out and found a gig. My first gig as a solo was at the Thunderbird coffeehouse in November 2010. I played anywhere they would let me. One night I was playing Genuine Joe’s on Anderson Lane and an old band mate from my Rabbit days (that is a different story – it is at the end of the beginning) walked in. Bruce and I have known each other since high school. We also logged 9 years on the road with that Rabbit thing and are still good friends today. Anyway, Bruce was itching to play guitar again so I invited him to join my party of 1. Now we’re a duo, we play more gigs and eventually add Win on bass and finally David on the drums. Over the last 4 years we have built this thing up, even rehearsed a few times, and have become a real band. The last leg on this trip was linking up with Phil Mezzetti -- producer and recording engineer extraordinaire. Phil did some time on the road with Rabbit in the early 80’s (there’s that Rabbit thing again) but now he owns his own recording studio. We begged him to help us make this record and in between floods and near death experiences he relented and went way above the call of duty and put real sweat and heart in this record. Thanks Phil. John Lennon guitar. Beautiful daughter Kate and tub time. Reconnecting with friends. These are the steps on my path that brought you this CD. Hope you enjoy it – there are pieces of my life in this music. Originally from NYC, John Guinan has found a home in the the Boston music scene and community. In the words of a musician friend recently, "John is a true devotee to the guitar and to songwriting storytelling. He always credits his influences, - Richard Shindell, Ellis Paul, and Dan Bern, for example, but his originals are full of sweet grit and urban nostalgia that feels really familiar, and that personalizes his cover renditions as well." John is very active on the open mic scene in Boston and Metrowest and also hosts open mics in the area. Jimmy Buechler of GetZen will be performing at BSH. Bring your kids and join us for an hour of creativity and fun! Each child will have the opportunity to choose from an array of materials to create a one of kind necklace. We will be offering tons of beads in lots of different sizes, colors, shapes, and textures. Using different colors of Irish waxed linen we will be teaching basic knotting techniques and encouraging all kids to explore their own designs. This is a great opportunity for your child to tap into their inner designer. When your child is finished with their creation they will be able to fill a small bag with materials to take home and create another masterpiece. The Other Other Brothers will be tuning their kazoos and brandishing banana phones for your familial delight! You can find them the first Saturday of every month from 10am-noon. Bring the little ones, grab a coffee and pastry, and sidle up for a one-of-a-kind kids’ show filled with folk songs, joke songs, and storytelling magic for everyone! Our goal is to inspire creativity and fun that shows kids a whole new way of looking at art! This comedy showcase is headlined by Elizabeth Spears and featuring comedians Lando Shepard, Ben Keefe, and Taylor Dowdy. The evening will be hosted by comedian Andrew Wagner.